Come to Istria, and you're bound to hear the word 'pomalo' sooner or later. Pomalo literally means 'slowly' but it seems to mean a lot more. It's a standard reply to many questions here. Ask someone how they are. The answer will be pomalo. How's work going? Pomalo. How's your mother? Pomalo. What's for dinner? Pomalo. Would you like a coffee? Pomalo. 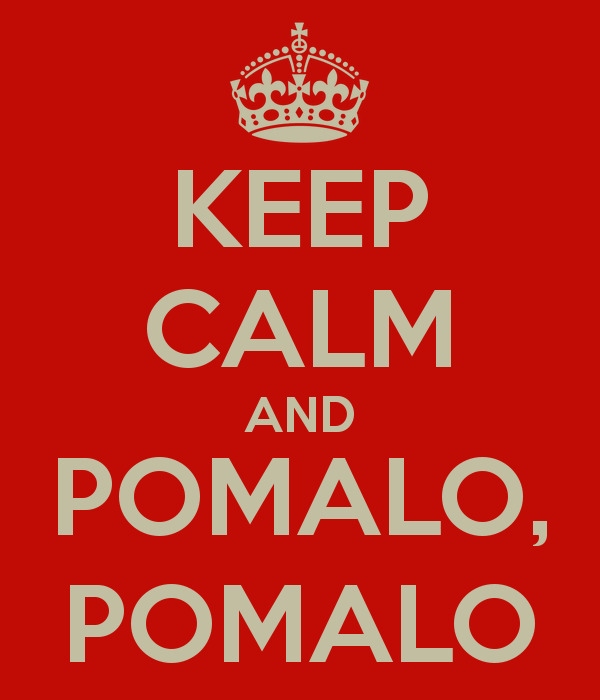 Pomalo is practically a way of life. Italy has la dolce vita. We have pomalo. Indeed life has its own rhythm here, and you can only give in to it. Things can take time. Locals often ask me how I can put up with things here. Tedious things like the administration, paperwork, waiting for repairmen, expecting a letter (the post is so slow!)... All of these things go very pomalo. But what locals don't understand is what I went through while living in India for 6.5 years. Those long years taught me patience. I learned there's no point getting upset about things you can't control. You just have to give in and things just somehow work out in the end. So the small daily challenges here are nothing compared to daily power cuts, water problems, impossible traffic... I learned how to 'adjust' in India and it was a valuable life skill. So I can deal with all these pomalo issues. An example of a current pomalo issue is our electric oven. Months ago, the thermostat stopped working, so the oven overheats and then turns off. We bought it at Ikea in Trieste along with the rest of our kitchen two years ago. Ikea Italy was quick to reply to our email inquiry with the helpful information that the warranty is valid across the EU and that we can contact Ikea in Zagreb to get it repaired. In true pomalo fashion, it took a few calls to Ikea in Zagreb until they finally got back to us with the phone number for the Whirlpool service centre. I've lost count how many calls we made to Whirlpool, but after four months and still no phone call from them as promised with details of the nearest certified Whirlpool serviceman, I called them again and used a tactic I had learned in India... No use getting angry, just tell them how difficult your life is without a functioning oven and make it sound much, much worse that it really is. We haven't been able to use our oven in months! It's been broken since before Christmas! There were no Christmas cakes or cookies for us! It's a really dire situation after all these months and still no call from your service centre. We've been living on only boiled vegetables all this time! How much longer do you think it will take?? The man at the Whirlpool service centre promised to get back to me that very day. I hung up with low expectations – but lo and behold, the sob story tactic seemed to have worked! He actually called back an hour later with the name and number of a qualified Whirlpool serviceman in Pazin, just a few kilometres away, and the news that he would come check out our oven on Monday. The repairman really did show up on Monday (after a call from me to make sure he was coming). He chatted away while poking the thermostat dial with his multimeter. He asked me how I enjoyed living in Istria, and told me that life is different here, that everything goes pomalo. I told him that I knew all about pomalo... that I had been waiting for months to hear back from Whirlpool so we could get the oven repaired. “You should have called me first,” he proffered, “I would have come immediately.” He then announced that the thermostat was kaput, and that it would take seven to ten days to get a new one from Germany. This was promising news. What's seven to ten days after waiting four months? Surely if the thermostat is coming from Germany, it'll be here in no time at all? My neighbour joked that they're just waiting for our warranty to run out! There are three years left... I'll surely have a functioning oven again soon? In the meantime, I will adjust.